Crummy Mummy (who drinks): Django Unchained - simply brilliant. 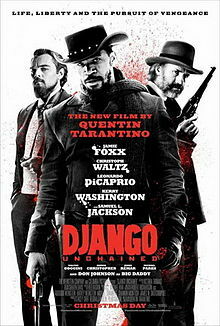 Django Unchained - simply brilliant. I'm so annoyed, because as I fell asleep last night - my head all a spinning after a visit to the flicks, I wrote (in my mind) a fab review of Django Unchained. But then I fell asleep and promptly forgot everything I had mentally written. Now y'all know that my favourite way of spending time, is taking in a movie. Even better when the movie rocks. I feel like running up and kissing all those cinema usher folk (although on that note - where is a fecking usher when you need one - those fab people with torches, or those women who stood down the front of the screen selling cornettos when you were a kid?) and thanking them, as if they personally made it. Getting out is such a palava - with sitters and bedtimes and bottles and all that jazz - that getting my arse on a cinema seat these days is rare. So it has to be worth it. And last night, it sure as hell was. But I loved it. From start to (slightly over-extended) finish. Infinitely cleverer writing than such fare as Silver Linings Playbook - with Tarantino-isms in full force (funky soundtrack, zooming shots, monologues galore, ingenius humour, cameo appearances and lots of bloodshed) it was a joy to listen to - let alone watch. Husband argued that Christoph Waltz played much the same character as he did in Inglourious. But that's where I disagree. Whilst yes, he was prone to charming explanations for his actions - they came from a good heart this time - so we got to see the other side of the coin. The actor looked like he was having a blast - and had invited us and Django along for the marvellous ride. Such a wonderful pairing - the virtually silent Fox and the eloquent and knowing Waltz. I loved that Waltz never patronised the slave that he had freed - nor abused the gift that he had bestowed upon him. Fox simply walked like he was the coolest man alive - even wearing the most hilarious Austin Powers style outfit I have ever seen... truly, I'd have followed these partners in crime across every state... oh that's right - we did. Midpoint - and Di Caprio. If anyone ever argues that he cannot act - then I'd like them to imagine any other actor giving such rich characterisation to what could be perceived as a pantomime part. In other hands this would have been seven shades of bad. In his hands - a masterpiece. He barked and twitched and sucked on his cigarillos and I was utterly mesmerised. He steals every scene he is in. From the minute we lay eyes on him we seek our own vengeance on a man capable of such brutality - with such a lack of respect for human life. So if you fancy a night at the movies - why bother with things like The Hobbit, or trite rubbish like Skyfall - or even the oddly emotionless Silver Linings Playbook (as nice as it was - memorable? Meh...) - and instead hunker down for this wonderful (quirky as ever) Tarantino-at-his-best delight.